Blog Author's Note: The following was written in December 2005. It was my second ever blog post. Titled "A Little More About Me," it was an attempt to explain where I was and what I was doing. A lofty goal, I know, but still a noble attempt. Much has changed since those heady, clueless, naive days of yesteryear, but the newness hasn't worn off. As much as I wanted to edit this before re-posting it, I did not. I was apparently more lax (or less obsessive) about proofing when I started blogging. There are a few minor errors that are driving me crazy - of course. Additionally, some minor details and have changed slightly. I can say that blogging as frequently as I do has improved my writing noticeably... something I didn't notice until today! Words are funny things. Not just the evolution of their meanings and the constantly changing idioms, colloquialisms and provincial usage of different phrases, but the manner of saying exactly the same thing but meaning the exact opposite. For example, when something or someone causes or makes something happen, there are different ways of attributing the resultant action to its cause. We can assign blame or we can award credit. Obviously, one is “bad” while the other is “good.” So when we speak of the cause of… say, the war in Iraq - are we awarding Bush credit for the war? I think not. In fact, in a Los Angeles Times story recently, it referred to the administration as finding someone to blame the war on. In this case, it was a story about George Tenet’s new book and the idea that he is the administration’s scapegoat for the fiasco in Iraq. After all, it was his “slam dunk” statement. "Tenet's comment's represent a new and potentially politically damaging source of fire in a battle among Bush administration officials over blame for the Iraq war." These are the reporter's words, not mine, not a source's and not attributed. Like everything else that has to do with this quagmire, it is far more complex than all that. One simple little instance of over-optimism shouldn’t be enough to lead our nation into this unnecessary and unmitigated disaster. Of course and as we now know, it was much more than that. And that’s not the point. What is important here is how we are now referring to the war today as opposed to four years ago. No one in the press was “blaming” anyone. It was not yet a “civil” war. Now, the press, in many instances, uses different language when assessing the war - and finding blame is one of them. The credit, however, will not be awarded to Bush. Ever. There is the potential for credit to be awarded to whomever extricates us from this mess, but it won’t be given to this president or this congress. Like the problem, the solution will be complicated, but eventually there has to be some sort of resolution. So here’s the question of the day/week/month/year… millennium: How long before this happens again? When will the watchdogs wake up? Is it possible that the “lessons learned” this time really were? It’s not just the press, or the congress; it’s everyone. Somehow, someway enough of us - with or without the mainstream media’s help - have got to stand up before a military conflict gets signed off and say, “Um… excuse me. Wait just a darned minute. What about… ?” And then ask those hard questions. Military engagement is the most serious foreign policy decision a nation can ever make. Don’t you think it’s time we gave it just a little bit of critical thought first? For the last several weeks, I have not required Blogger's word verification protection for commenting on my posts. It seemed to be more trouble than it's worth, so I threw caution to the wind and eliminated it. At first, everything was fine. No spam comments, nothing weird, no problems at all. But recently, slowly at first, the spammers have started spamming me. I don't know how they found me and decided which posts to hit. The most recent post was one written some weeks ago. I wouldn't even have known if I didn't have email notification enabled. But they're getting closer and more frequent, like some kind of spreading disease. To nip it in the bud, I have enabled word verification again. The other option would be to moderate my comments, but I don't want to do that yet - I might some day, but just not now. I am not cool with spammers posting on my blog. Not at all. It's bad enough that I have to delete the numerous emails that make it past the filters everyday. It's like some twisted game of cat and mouse... one I am no longer going to play. I have been pondering, recently, what genre my writing falls into. Actually, more often than not, I know precisely what kind of writing I am tasked with. When writing for the newspaper, of course, it’s straight journalism - the who, what, why, where, when and how. If it’s a research paper I’m engaged in, then I must carefully seek material and cite it in the final product. My ponderance today has to do with what, exactly, is my default writing style. With no constraints - what comes out? I guess in modern terms, it could be defined as my blog style. In days gone by, it would be the style of my personal journal or diary. Written in the first person to be sure, but it’s more complicated… and yet at the same time much simpler than all that. It is perhaps the least restrictive form of free writing. However, when written for public consumption - a relatively new phenomenon brought about by the advent of web logs (blogs) - it must be coherent. Disjointed ramblings and accounts of my daily minutia without any deeper inference or reflection won’t garner many readers. And isn’t that why I do it? I have written, by hand, journal entries during particular periods of my life in the past. Not only were these entries not meant for public consumption, they apparently were not meant for my own consumption. I have not gone back and re-read those entries. Although I didn’t know it, those writings were about the writing - not the reading. They were truly one-shot, single draft entries. There was no thought as to direction, theme or even organizational structure. It only had to make sense as the words spilled out in that single instance - never again. That’s not to say that my scribblings were nothing more than the therapeutic pairings of words and punctuation. It also doesn’t mean there is no future value in those musings. Quite the contrary, I expect I will have occasion to re-examine those forgotten pages and extract insight from them. It has always been my intent - yet today is not the day. Although I am hard-pressed to remember the specifics of what I wrote, I do remember the nature and style of my musings. Except for grammatical and organizational enhancements, it is remarkably similar to the genre I am writing in at this very moment. And so often it is true that I can relate to writings of the likes of Vidal, Twain, Dillard, Stevenson, Orwell, Mencken, Baldwin, Didion and so many others. I wonder what that must have been like. They take me back to a place I’ve never been. On the most intimate level they share with me our lives. And I get that! Perhaps it is because of the breadth (if not the depth) of my experience that I have a wealth of revelations to share. My life has taken me in many directions and continues today. Though in retrospect it represents so much acquired wisdom, I was often, in the moment, nowhere close to grateful for having the experience. And more often than not felt no wiser after the conclusion of said experience. Indeed, quite the opposite; I felt feeble, weak, shortsighted… stupid - these were the adjectives that best described my behavior. Not all were bad, yet each and every one of my experiences provided me with an opportunity for growth, however, not necessarily in the moment. There is great comfort in knowing that stupidity is not exclusively mine. It is equally satisfying that my predecessors have derived from experience that which I often had to find for myself. The insights are so simple yet elusive. A mentor once described these revelations as “Brilliant flashes of the obvious.” And so they were, but again I am not alone in the self-discovery of so many basics in life. It’s nothing like I thought and at the same time, it’s everything I knew. Peace. Sometimes it just finds me. Unexpected, yet undeniable peace. It has been a very busy week. Personally, professionally and nationally, there has been precious little time to take a breath and decompress. Some of it I saw coming and some of it… well no one could know. It is with this recent confluence of commotion in mind, in the midst of this flurry of all sorts of activity that this moment of reflection - this peace - has caught me unaware. And as such so very much more so profoundly accepted. Much of what lies ahead of me is known; it has been so for days and weeks. I am prepared as much as I can be. Other avenues will present themselves and decisions will need to be made. Still other events, some of which will demand some kind of action or reaction, will likely unfold as well. I want to know. I want to be able to make sense of it all. But I can’t. I can only continue on from this point forward - from this place of peace and meet the next moment and whatever it may bring. I am tired and the end of this particular go-round is yet some time away. So far, so good and barring any major disasters, all I have to do is what I have to do. That’s all and that’s enough. I have written here about my inability to do just this much… about the time and energy I have expended tying to find ways of avoiding the work that needed to be done. I have made the discovery - I worked harder at avoiding the work than doing the work in the first place would have been. And now, so much of it feels so trivial but I know it’s not. So here it is, the arrival of the new weekend and with it, a moment of peace. I didn’t create it; it just fell into my lap. I can’t give it away or tell anyone where to find it. I can only implore anyone who might be trying to find it to keep seeking - it’s there. It will become apparent when you least expect it. It will find you and for at least a few precious, fleeting moments, you will know peace - it will be yours. Since releasing the excerpts from the package sent by Virginia Tech killer Cho Seung-Hui, NBC News has received more than just a little criticism. Indeed, this story is so big that every little nuance… anything remotely connected to the story is being put under a microscope and reported on ad nauseam. Ironically enough, the decision to air the material delivered to NBC News has become itself a news story. If not for the “gift” left by Cho, the media would be filling all of that airtime and every available inch with anything and everything it could discover about this “seriously disturbed individual.” Cho saved the media a huge amount of legwork and opened insights about what drove him. Did he get what he wanted? Some are saying that by airing this “manifesto,” Cho has ultimately won. But think about how ridiculous that sounds. Cho is dead - and he’s not getting any better. Last I checked, to get any enjoyment or satisfaction from an act, one must be alive to experience it. Furthermore, even if Cho could somehow relish his media spotlight from the grave, he would soon realize that no one agrees that he was any kind of victim. He would be crestfallen in the discovery that he is being regarded - at best - as “a seriously disturbed young man.” Mostly he’s being viewed as some kind of homicidal whacko. For those with a religious leaning, I’m guessing that Cho’s last act earned him a one-way ticket straight to Hell. Do not pass go, do not collect $200. Yet he is somehow enjoying the last laugh? I don’t think so. Does this coverage intensify the pain of the community, the survivors and the victims’ families? Undoubtedly, but surely they would understand that news of this magnitude must be reported. Even without Cho’s help, there would be extensive coverage of Cho - a disproportionate amount. But even without considering the civic responsibility of the news business, let us remember that it is a business. If no one tuned into this stuff, no one would report it. People want to know, despite how much they say they don’t. The numbers don’t lie. Did NBC and others overdo it? Was there more coverage of Cho’s package than “necessary?” That’s a matter of opinion and judgment. But to say that NBC had a responsibility to quash this information is nonsense. They have a responsibility to report it. Besides being mathematically impossible (only slightly less than half can be “above-average”), it is laughable. Just one short jaunt through town will reveal just how good “average” is and how “bad” the drivers who profess to be above that mark actually are. Perhaps “bad” isn’t the correct term. Maybe if all distractions to the act of driving were removed, many of these accidents waiting to happen would actually be competent operators. Full disclosure? My driving record is nothing to crow about, and I have had my share mishaps - including those brought about by distraction. Driving, for some of us (most of us? ), seems to be second nature… almost part of the autonomic nervous system. Indeed, it seems as if we were born to drive. It’s in our genes. We have become so comfortable behind the wheel that it makes perfect sense to use that otherwise wasted time doing something productive. According to a 2005 report by the National Highway Traffic Safety Administration and the Virginia Tech Transportation Institute, almost 80 percent of crashes and 65 percent of near-crashes happen within three seconds of some form of driver distraction. Although using cell phones was the most common distraction, it is not the only one. And the driver’s age has much to do with it. Eighteen to 20 year olds are four times more likely to be in a crash due to distraction as drivers over the age of 35. I remember a news story about four bicyclists, two couples, riding on a road in the foothills just south of San Jose, Calif. It was a beautiful spring or summer weekend day on a paved road used frequently by recreational cyclists. It must have been 20 years ago now; cell phones weren’t around, compact disks were just emerging. A young girl of 19 or 20 was rounding a turn in a Chevy Blazer on the same road approaching the group of cyclists, but she didn’t know it. She was reaching around behind her seat, fishing for a cassette tape to pop into the stereo. Seconds later, two cyclists were dead and the other two seriously injured. The driver was not a “bad” person and perhaps not even a “bad” driver. But in that instance of inattention, two lives were cut short and three others permanently altered. It only took a split second. Examples of such tragedy are abundant. Although there are numerous new gadgets and gizmos to take out attention away from the road, it’s not the distraction that is responsible - it’s the distracted. Laws and proposed laws to regulate cell phone use while driving are all the rage. Let’s assume these laws are successful in reducing the accidents that can be attributable to cell phone distractions. What about the next distraction du jour? Ultimately, it is the operator that should be held responsible. The same laws that apply to drunk driving could be applied to any distraction. Statistically, there is little difference. To those killed by distraction, there is none. Thirty-one… now 32 killed at Virginia Tech. Initial “breaking news” headlines emailed and forwarded to my BlackBerry from the New York Times, then the Washington Post and finally the Sacramento Bee reported the number dead at 20 or 21. I received these reports while sitting in a classroom at Sacramento State University - peeking at the screen of my personal digital assistant, surreptitiously answering its silent vibrations. Now, more than two hours later, I finally have occasion to open my laptop to read the full story and it’s worse than I imagined. It could have gone either way. Initial reports in instances such as this are often inaccurate. When news like this breaks, details are often sketchy; new and updated information is constantly becoming available. I was hoping that the initial reports were wrong - that the death count was too high. As we now know, it went the other way. There are many questions yet to be answered, but the resounding senselessness of it all couldn’t possibly be more pronounced. Although I haven’t yet reported on a tragedy of this magnitude, I have covered other breaking news and experienced the singleness of purpose that getting the information to print as quickly as possible represents. While in the midst of the event, whether it’s a fire, an accident or a shooting, getting the information out is the reporter’s only job. The gravity of the event, at least for me, doesn’t come into play until after I’ve had a chance to decompress - after the deadlines have been met. While reporting, I simply don’t have time to make any judgments about what it all means, only to report on what it is. In this instance, I am a news consumer like most everyone else hearing about this calamity today. I am shocked, disgusted, dismayed… and distracted. If I were assigned to this story, all of those emotions would have to be put on hold - it’s all about getting the story out. Like nurses, firefighters, emergency medical technicians and many other professions where a level dispassionate decorum is essential, reporters must be able to disassociate themselves from their story or risk becoming part of it. There is no time to think. The irony of where I was when I received this terrible news is not lost on me. It could happen anywhere. It did happen anywhere - this time at Virginia Tech. No one is immune to this kind of idiotic violence and there is no defense. Sure the debate regarding gun control and a hundred other acts of second-guessing will shortly ensue, but at the end of the day, we can’t shield ourselves from every nut-case in the great big world. Unfortunately, this sort of insanity will likely be repeated again somewhere, someday. And there will be reporters there to cover it. The moral? Perhaps there is none. Perhaps it’s as simple as appreciating each day like it could be your last. For at least 31 at Virginia Tech, it was. I am currently researching a term paper regarding the media coverage of the Bay of Pigs invasion in April 1961. That’s right - 1961. It occurred about 18 months before I was born and is one of this nation’s historic moments that I have not had occasion to study in any real depth. Yes, I leaned about it during my journey through California’s public education system, but it was only a punctuation mark in a larger event known as the Cold War. The preliminary section of the paper is due Monday. The historic synopsis and introduction of the analysis represent perhaps about half of the writing, but only about 25 percent of the research. The story of the Bay of Pigs, including the intelligence, the decision-making process, the reasons for failure and the fallout can be told with a great deal of accuracy with a minimum of research. However, the meat of this paper, analyzing the media coverage - specifically that of the New York Times and the Nation - will be the challenge. And although this all happened 46 years ago, the parallels to the events leading up to our current foreign policy quagmire are eerie to say the least. But that’s not what I want to write about today. My last three pieces had to do with foreign policy; tonight I want to reflect on a much more personal and immediate experience. The research. I wrote a post a few months ago titled, “The Record’s Records.” I tried to reflect upon the experience of not just learning about history, but actually touching it. At the offices of my former employer, the Colfax Record, the newspaper’s actual physical archives of are housed. I could, on a whim, pick up a newspaper printed almost a century ago. Although I rarely had any reason to read the back issues, I would leaf through the pages just to enjoy the experience. The smell, the look and the velvety feel of that old newsprint is mesmerizing… almost taking me back to those days gone by. The New York Times back issues are recorded on microfilm and microfiche at the Sacramento State Library. Furthermore, if one is a subscriber to Times Select (I am) the archives are available online. It makes my job a little easier because I can do my research from home. The experience is enjoyable, much like researching anything else that interests me. However, the Nation, which has been in regular publication since the Civil War days, is only available in bound volumes. They are the actual print versions bound for the purpose of archival preservation. The fragile, soft, velvety feel of the slowly decaying newsprint - housed in the basement of the Sacramento State Library - had the same effect on me as did the Colfax Record archives. This time, however, I have a mission. I am handling these historic volumes to read the news as it was reported in real time… 46 years later. The context of the other news happening at the time, the advertisements, even the layout can deliver me to a place in time before my time. It is an experience that isn’t possible with the sterility of microfiche or the Internet. It feels somehow less authentic without the tactile experience of the actual physical documents printed in real-time at the time. As more and more documents are archived electronically, the ability to preserve the information indefinitely becomes a reality. It is a good thing - the physical editions have a limited lifetime no matter how carefully handled. Unfortunately, the physical connection with the past cannot be replicated electronically. We are fortunate that old - often very old - documents are still available to be handled, examined and read. Our children, grandchildren and great grandchildren will not be so fortunate. And they might never even know what they missed. Anyone who reads my musings regularly, or has taken the time to dig through my archives, knows me pretty well. True, I don’t divulge everything about myself here, but my manner of thinking is an open book - more or less. I don’t ever really have an axe to grind; I am not one to take things personally. I try very hard not to offend anyone, but I don’t sugarcoat my views in order to appease either. If you disagree with me, I won’t internalize it. Regular visitors here also know that I am, in equal parts, fascinated as well as frustrated by the body politic. My major is not just journalism with some odd minor, but rather the dual major (thus eliminating the required odd minor) of government-journalism. Although the course load is significantly heavier, I figured that after more than 25 years of chipping away at the game of higher education, it would be appropriate to spend a little more time to set myself apart and get a background such that I would know what I’m writing about. It is therefore somewhat ironic that I only venture into political commentary every once in a while in my blog. It isn’t that I don’t have anything to say - I almost always do. It has more to do with what this blog was originally set up to do and why it is named what it is. It is an account of my world through the process of introspection. It’s my way of thinking out-loud. It is therapeutic and relaxing. It takes me away from the rat race while at the same time enables me to see the greater picture with better perspective. It paradoxically focuses my attention by distraction. However, there are times when my professional specialization and introspection intersect… or perhaps collide. My last two pieces are examples. Actually, the second and perhaps more provocative piece was a rebuttal, but one based on the observation of human nature as it applies to politics. It was as introspective as it was political and could be viewed either way. Although I was as clear as I could possibly be about what I think of the competency (or lack thereof) of the Bush administration, I do not take the administration’s policies as a personal affront. Likewise, my criticism of the president is not a personal attack and should not be viewed as such. But for some, it still is. I understand that many people get very attached to or vested in a policy based on their ideology or experience or loyalties. I get that. Although I try not to get caught up in the hype, I am not exempt. I am always on my guard. Once an institutional consensus forms, it is very difficult to oppose. It has much to do with why the press as a whole did not report the “other” side during the run-up to the war. If the mainstream media - the agenda setters like the New York Times, the Washington Post and others had been more vigilant, perhaps this fiasco could have been averted. And it is a fiasco - the evidence is overwhelming. If anyone reading this disagrees - it is your right. After all this is still America. If you are offended by the stating of my opinion based on the facts as I see them, well, that is also your right. However, it is not my job to assuage anyone’s feelings - but know also that it is not my intent to offend. I don’t even insist that you believe me. Honestly, I don’t care. This is America and I submit that disagreeing with the administration is more patriotic - much more - than keeping quiet just to be nice. There will always be a constant proportion of the population who are solely ideologically driven. Many are otherwise highly intelligent except when confronted with challenges to their belief system. They would rather succumb to the demagoguery or simply just stick their collective heads into the collective sand rather than have their beliefs challenged. That number tends to be around 25 percent - it is as low as approval ratings ever fall. It’s about how many people still believe there are WMD in Iraq or that Osama Bin Laden and Saddam Hussein were bosom buddies. Then there are those who I would call “brand loyal.” They are straight ticket voters who generally identify with a party platform and stick with it, thick or thin. If you’re pro-choice you are generally affiliated with the Democrats; anti-abortionists, of course, align with the Republican Party. Other historical political party platform planks are not so easily identified anymore. Big government used to be the Democrat's territory, but the Republicans have created the biggest government ever. Still, those in favor of small government lean towards the Republicans, while the Libertarian Party, the only true small-government party, languishes as an ineffectual third party. Bush II has lost the brand loyalists. Even Nixon’s California numbers at the height of Watergate never fell below about 25 percent. Bush's numbers here are almost as low. People don’t like to be wrong. Some don’t like it so much that the facts don’t much matter. But the truth, for many, trumps personal righteousness - and comfort. The many Republicans who have the personal integrity to admit not that they made a mistake, but that they were wrong in supporting a president who has, are the reason for Bush’s ever dwindling support. Indeed, this president might even prove that the “loyalty constant” is too high. In my last piece, I ventured back into commenting on this administration for this first time since the 2007 State of the Union Address and the Democratic Response. Although I am not a registered Democrat, neither am I a Republican. I have no affiliation save this: I am not a fan of this administration; never have been. It’s not because Bush is a Republican. In my piece, I didn’t beat around the bush (sorry!). I called it like I see it, and Bush doesn’t come out looking good. I could have been far harsher - many of my readers were. There was one comment, however, that got me thinking. I'll be honest enough to say I have mixed feelings. Many of the politicians who were gung ho on the war at the beginning are backpeddling now (and those are the ones who truly make me sick and why I hate politics in general). I supported the war not because of WMD or oil but because Saddam Hussein was a nut who put children in prison, gassed his own people (anyone remember the picture of the dead man holding his baby, it's sightless eyes staring upward?) and ran those who disagreed with him through a woodchopper. Even the UN said he had one of the worst human rights records in history. My friends in the military who've come back from Iraq say we hear mostly the negative news and very little of the good, such as schools being built and women's rights being restored. If nothing else, one of the most evil men on the planet is gone. Becca ~ You asked some legitimate questions. Although I might not have the answer you're looking for, I do have some comparative information that could help shine some light on what the answer is not... but not necessarily what the answer is. If this sounds like fodder for a future post, you are right. Stay tuned, tonight or tomorrow a response will be posted. Although “Becca” uses a name, it is still an anonymous comment. There is no email or blog attached; there is no way to respond directly. There is no maliciousness in what she said… in fact, she sounds absolutely frustrated, dismayed and let down. I am sure that she doesn’t like being led down the garden path. What she is holding onto is valid: A very evil man has been taken out. She also claims that we are not hearing the whole story and there are a number of positive aspects to our taking out this dictator. Perhaps, but let’s start with her first point. Briefly, we are not the world’s police force. Congress never would have authorized military force just to save the people of Iraq from Hussein. Bush, et al had to have more and he/they knew it. They either grossly misinterpreted the intelligence (for those inclined to be generous) or fabricated it (for those who are not). Furthermore, before Iraq invaded Kuwait, we didn’t have any problem with his atrocities - nobody cared. If taking out “bad” people is the criteria, we should look to our own history and give someone else the job. Can you say Pinochet? As far as not getting the whole story, there is an element of truth in that statement, however, it’s a two-edged sword. We also don’t get all the information on the violence, the bloodshed, and a great many other “details” that we don’t "need to know." How many coffins have you seen taken off the transports at Dover AFB? Our government doesn’t want us to see them - access denied! Furthermore, we can’t get reports of schools and other social good because if reporters venture outside the Green Zone without serious armament, they get killed. Or kidnapped, tortured… and then killed. Finally Becca, you say, “If nothing else, one of the most evil men on the planet is gone.” To which I ask, at what cost? How many good men have to die? How many innocent civilians have to be blown up. True, Hussein was bad, but is it better now? You seem like a sensitive, thinking and caring person - it is not my wish or desire to make you feel uncomfortable. However, if you are taking comfort in your statement, I am duty bound to challenge that comfort. I don’t know. Really, I don’t. Sometimes it all seems so very clear to me, and at others… not so much. I am an observer. I pay attention. Although I tend to ask a whole lot of questions, I prefer to make my discoveries through observation. Listening, watching, comparing and analyzing. It’s often better to be on the outside looking in because it’s impossible to gain a wide perspective from the inside. And that, I think, might be part of the problem. But again, I don’t know. We have a president that seems oblivious to the reality he has created. Could he really believe that his war is justified? Still? Is it an exceedingly large ego that has kept him blinded? Could it be some sort of divine misguidance? Is it possible that he is so embroiled… so immediately connected that he can’t possibly see the whole picture? There are, of course, the loyalists - the Bushies - that will blindly follow their fearless leader no matter what. Even if Bush himself abandoned the cause, these followers would not. But for those who still can think for themselves, there is no such love. We now have a congress that is showing signs of a backbone, however soft it might be. Say what you will about the accuracy of polls, it is impossible to ignore the trends and consistency of the president’s approval (or disapproval) numbers, especially where foreign policy is concerned. His back has been up against a wall for some time now. A Democratic congress has attached a number of amendments to the emergency military funding bill. Some are opportunistic pork barrel projects and, of course there are the “redeployment” targets. Bush says he will veto the bill - and blames congress. Congress blames Bush. And the beat goes on. Ultimately it really doesn’t much matter. This is much ado about political posturing and not much else. If the troops don’t start coming home in March of 2008, they will in January of 2009. This war will end with this administration. Bush should just go ahead and sign the bill; he’ll have the opportunity for his “surge” to work - or not - either way. But it’s not as much about the war as it is the grab for executive power. Bush is nothing if not a man of principle and there will be no reneging if this Bush says, “Read my lips.” He said he would veto the bill and in all likelihood he will. What then is congress to do? The president’s approval ratings will never recover. He will go down in history as one of the worst presidents ever - especially where foreign policy is concerned. Although the reputation of our country was not good before, it is in the gutter now. It will take decades to recover from the ill will created in just the last four years. Congress and the press bear much of the responsibility, but ultimately the buck stops in the Oval Office. We cannot win this war. Apparently we cannot even end it. What we need is a regime change. 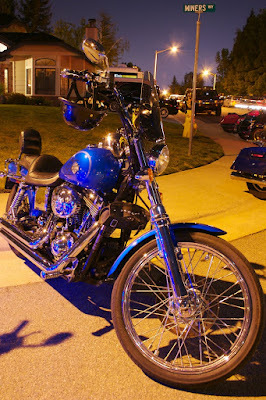 I shot these at a party for a friend who was celebrating the passing of a major milestone. These shots were taken out in front of his home at about 10:30 p.m. These pictures haven't been touched at all, they are exactly how they came out of the camera. The only thing I did was convert from RAW to JPEG. 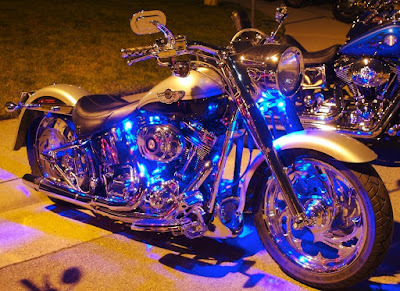 The lighting came from an overhead street light and the blue accent lights on the second Harley. Canon Digital Rebel, ISO 100, 18mm, f7.1 @ 30"
Canon Digital Rebel, ISO 100, 25mm, f5.6 @ 20"